Everyone loves the ease of entertaining an informal dinner. We are guilty all too often of pulling out the paper plates and serving things buffet style. And if that’s what it takes for you to invite some friends over, great! But it can be a nice touch to set a table and share a meal that you and a few close friends can gather around. Having a sit-down dinner doesn’t have to be complicated. We think it’s all about keeping it simple…. otherwise, the idea of setting a perfect table and trying to figure out what you’ll talk about all night may be enough to make you call in the take out. Here are a few easy tips to keep the night lively, the table setting easy and elegant, and how to pull it off without a hitch. And if you still want to get take out, make sure you order well ahead of time so you can put it in some nice dishes to make it look like you slaved all day over the stove! We suggest setting the table the night before. That way it’s all done and all you have to work on is the meal. A table setting is EXTRA easy if you use plain white dishes. I love having colorful dishes, but about 10 years ago, I ditched my colorful set and bought clean, white, simple dishes. They look great displayed in the cabinet, make the food look tastier, and add an easy elegance to a table setting. I don’t like spending a lot of money on dinnerware and I searched for something that would not break the bank yet would also hold up to everyday wear. My favorite line is from Crate & Barrel. They have a line of dishes called their Essential Dinnerware. It has simple, clean lines and its held up to just about everything I’ve thrown at it. I have a few pieces that have chipped over the years, but the line is still around 10 years later so it’s easy to just buy another plate if the need arises. The best part is that even though the line is porcelain, they are very inexpensive. A set can be purchased at a discount for $36.95 for 8 dinner plates, $29.95 for 8 salad plates, and $29.95 for 8 bowls. That’s under $100 for a whole set of 8! Take a napkin (we suggest going to the dollar store and getting REAL white linen napkins). Fold them into a rectangle and place it to the left of the dinner plate. Place the fork in the middle of the napkin. Place the knife to the right of the dinner plate, blade facing in towards the plate. Align all the silverware so that the bottoms line up with the bottom of the plate. Imagine the dinner plate is the face of a clock. Place the dinner glass at the one o’clock position of the dinner plate. Make sure the entire glass is on the place mat. You may need to position the plate and silverware lower towards the bottom edge of the place mat so they all fit. OPTIONAL: If you are serving wine, or would like to serve a spritzer in a wine glass, place it to the outside right of the dinner glass. Place a sprig of thyme or rosemary in the center of the plate at a slight angle. If you are setting the table the night before. Wait to place the herbs until an hour or so before dinnertime. Voila! A basic table setting all ready to go! If you would like to serve a salad on a smaller plate, simply put your salad plate on top of the dinner plate. You can put the sprig of thyme on top of that. You can also put a smaller salad fork to the left of the larger dinner fork. Lastly, if you are serving soup or a saucy dish like curry, simply place the bowl on top of the salad plate or dinner plate. The important thing is not to stress about it! You can stick with the basic setting for ALL occasions and you don’t need a salad fork if you don’t have one. The table will look great either way. For a touch of color and seasonal interest, we like to add a few flowers to the table. Do not go and spend big money on a fancy bouquet. An inexpensive bouquet is all you need. We like to cut the bouquet down and divide it among a few small vases or mason jars. That also keeps them lower to the table so you don’t have a giant bouquet preventing you from seeing the person across from you. We also like to add a few votive candles to the table. This can really set a relaxed mood yet you don’t have to worry about candle wax dripping all over. An enchanting compilation of 94 of the best jazz artists from Billy Holiday, Ella Fitzgerald, Louis Armstrong, Nina Simone and the rest of the best! Think nostalgic evening over candlelight, lingering conversations, and letting the dishes just sit as you reminisce all night. A jazzy instrumental mix that you won’t have to think about. It will just play nicely in the background and add a light, happy mood. This is an easy going mix of easy vocal pop that plays nicely without getting weird or feeling like you need to forward a song. This has a whopping 449 songs that include everything from BB King to Cold Play. It’s a nice mix of music that won’t get out of hand while still remaining upbeat. 449 songs in this mix means once you set it, you can forget it. And there you have it. An easy table setting, mood-setting music, and you’re on your way to a memorable evening. What is it that draws us to before and after’s so much? There is something uplifting about looking at a project that seems overwhelming, maybe even impossible, and seeing it transformed with new energy and purpose. That is what we love so much about helping our clients transform their homes. Of course, it’s the cherry on top when the process results in our listings selling for much more money and putting extra dollars in our clients pockets! One of our most recent projects was this fun Latona listing. The home was being rented by a group of room mates and it needed a major overhaul to unveil the beauty that was hiding within. Before we worked our magic, the home was cluttered and dark. There was way too much furniture and it was placed in areas that inhibited flow. When a home feels light and airy, it helps us to feel calm. Since we want our homes to feel like a sanctuary, this is an important emotion we want prospective buyers to experience when they walk through our listings. Here is how we transformed this home to show off its best features and create a calm, enjoyable experience for buyers. Paint is one of the single most important things to address. It sets the mood for the entire space. If the paint is too dark or if the color is not suitable, it can convey the wrong message and make a room feel much smaller than it actually is. Fortunately, for the amount of impact it makes, it is also one of the least expensive things you can do. In this listing, we lightened all the walls to an off white color. Because the home was built in 1960, the ceilings are lower and although the rooms are fairly large, they are somewhat disconnected. This near white color on both the ceilings and walls gave the illusion of taller space and also enhanced the size of the room. Keeping the color consistent throughout the entire home gave it a better overall flow. This living room had way too much furniture. The massive fireplace is oddly shape and it juts out into the room, taking up precious floor space. In most cases, we love fireplaces! But the size and style of this one just didn’t work for the home. As much as we would have loved to remodel it, that wouldn’t have been cost effective. The name of the game with our transformations is to spend the least amount of money for the most payoff. Since the design of this fireplace gives the room a narrow footprint, it was important to keep the furniture minimal and also use pieces that were more petite in size. This opened up the room to feel larger. We used bold pieces that took the spotlight and brought attention away from the elephant in the room—the huge, oddly shaped fireplace. We have no idea what purpose a rug played in being hung over the French doors to this room, but it was hiding one of the best features of the home. Double glass French doors opened up to a generous space beyond. Because this room sits right off the entry and living area, opening up the doors made the entire main floor feel much bigger and brighter. Now when you walk in the home, you get a much more energizing feeling and it also made our smallish living room feel much bigger! Adding a desk and modern console showed buyers that this room worked great as an extension to the living room or played double duty as a library or office retreat. The kitchen had been remodeled but it was quite long ago. The Corian countertop isn’t really in style, but the neutral color worked. It would’ve cost far too much to update the counters and we felt that because they were still neutral, just a few small changes could modernize this space. The appliances were old and tired so the seller brought in new stainless steel pieces including a higher end stove. By updating the appliances, fixing a crack in the counter, and bringing in a few minimal pieces, this kitchen feels stylish and shows off an expansive amount of space by removing unnecessary clutter. Flooring takes a close second to painting when it comes to huge impact for the least amount of cost. If the flooring is in poor condition or the carpet is dirty and dingy, it doesn’t really matter how much staging and work we put into the home. Bad flooring will offset beautiful design. It can make buyers feel that the home was not lovingly cared for and that there is much more work to do than there actually is. These types of impressions can make a buyer look elsewhere for a home or offer a much lower price than it would have cost to replace or repair flooring. This home has hardwood flooring throughout the main level. Even though they were in need of repair, that is the beauty of having hardwood floors. Restoring them back to their natural beauty is not too expensive and adds more value to the home. This basement was a hodgepodge of rooms lacking a clear purpose. Half the basement had cement floors, no trim work, and no lighting, so it technically was unfinished. Adding carpet and trim, then hiring an electrician to run electrical and add lightning increased the value to the home significantly because it added finished square footage for very minimal cost. Let us break this down a bit. The unfinished area was about 600 square feet. Our sale price netted the seller $394 per square foot. 600 square feet multiplied by $394/square foot equals $236,400! 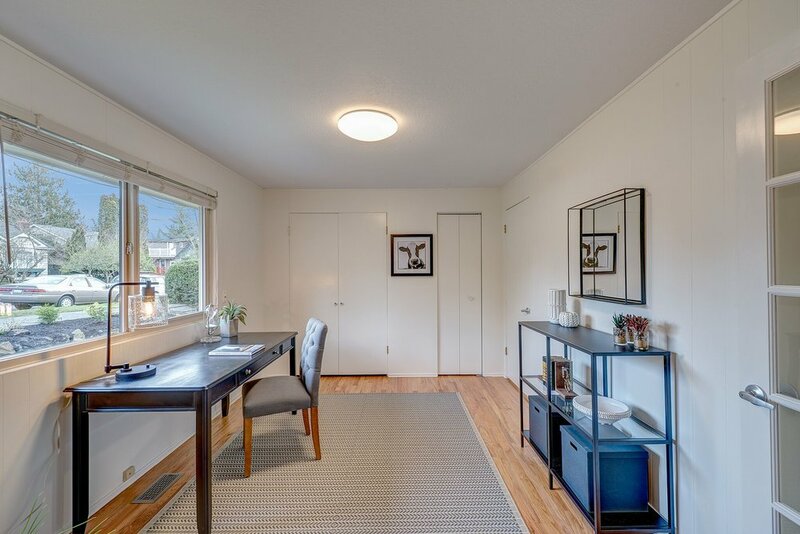 Yes, we think the minimal cost of carpet, trim and some electrical made this well worth it for our seller! This was worth a team high-five! We’ll admit, we had a lot of fun with this project and we were thrilled the seller was open to making these changes. The end result was a home that we were able to list for a much higher price than if the seller did nothing. We were even more thrilled when it resulted in a sales price $45,500 over the asking price in just 33 hours! What do you feel made the most impact in this transformation? We welcome your comments below. And don’t forget, if you are thinking of selling a home, we’d love to offer a complimentary consultation to help you determine small changes that can help you get the most money when you sell. Furnishing an open floor plan can be tricky, but it is a great opportunity for creativity and adding your own style! 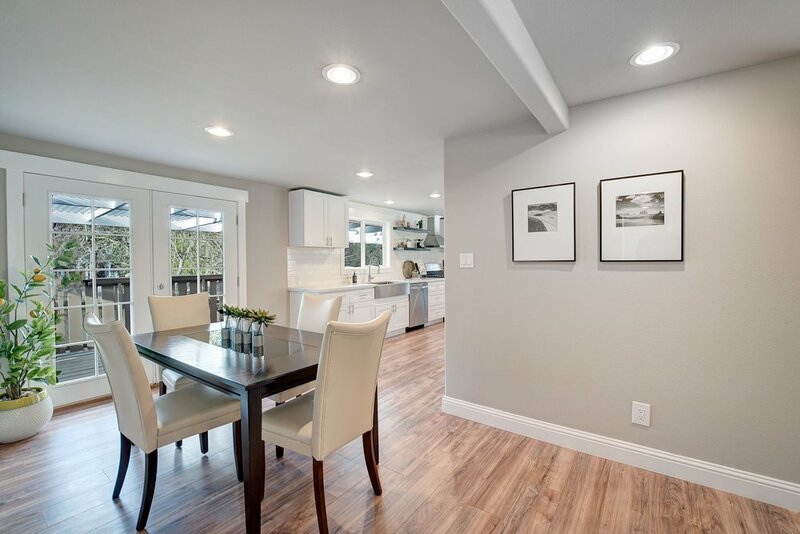 This house has a beautiful open floor plan with modern details, and it was a fantastic opportunity to add some warm touches, and unity throughout the space. So you got your dream home! Now it’s time to really make your vision come to life with furnishing and styling. This can be an intimidating process, but it can also be fun! We live in a fantastic age of shopping where there are unlimited resources to help you find the furniture that fits your needs, style, and budget. While we love shopping local and supporting our small businesses, the internet has some fantastic resources and stores that will inspire you to create a space that feels uniquely you! When it comes to furniture and decor shopping, you probably think of the standard big name stores like Crate and Barrel, Dania, etc. (stores we love! ), but there are SO many options out there if you’re looking for something different! We are so excited to be sharing some of our favorite places to shop that will give you that style you're looking for! 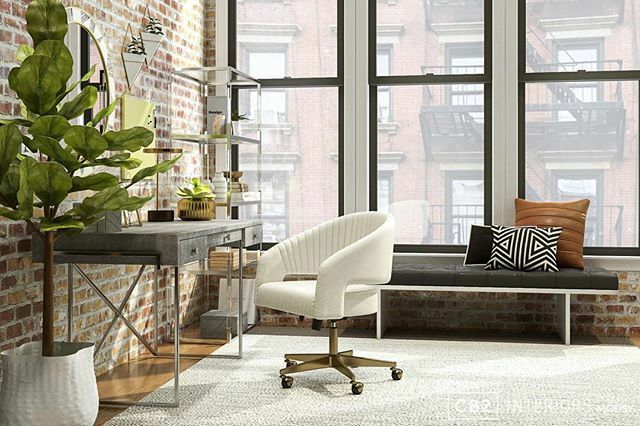 As the trendy little brother to Crate and Barrel, CB2 is the perfect place for modern loving shoppers. With a sleek and urban aesthetic and never lacks of marble, wood, and beautiful textures, you’ll be sure to find statement pieces that are a perfect mix of modern and timeless. And if all of that doesn’t win you over, the prices will! Though CB2 is never short on quality, their prices are surprisingly affordable! Is there anything better than completely furnishing and styling your new house from the comfort of whatever couch you need to replace!? At Article, you can shop for beautiful, quality pieces for affordable prices, completely online. Article offers beautifully simple and cohesive designs that will be sure to make your home stand out! Another amazing online furniture store! AllModern is a part of the Wayfair group, which means their goal is to bring modern design at affordable prices to everyone! This is a fantastic place to shop for absolutely any of your design needs from fixtures to furniture in beautiful styles that are all the rage. West Elm is definitely the mid-century modern mecca. With beautiful custom velvet upholstery options, brass accents, trendy prints, and a cohesive style, you’ve reached the jackpot. We love how beautiful their pieces look either alone, or paired with other West Elm pieces. 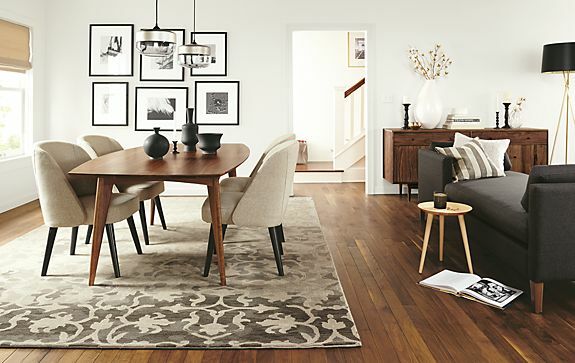 With mid-level prices and epic sales, West Elm is perfect for anyone looking to give their space jaw-dropping style. Who doesn’t love Crate and Barrel! This classic store is so well known for a reason! Though they may not be on the cheap side, their pieces are consistently high quality and sophisticated. Crate and Barrel has been around decades and always proves to be timeless and classy! 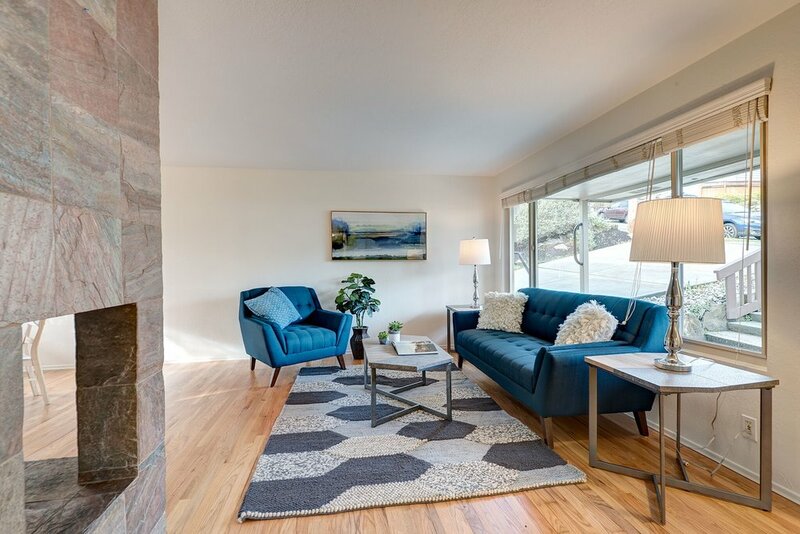 If you're looking for modern, mid-century modern, and classic, this is the place for you! Similar to Crate and Barrel and West Elm, Room&Board specializes in customizable sophistication with designs built to last. Though their prices might be slightly higher, their high quality and attention to detail is undeniable! Timeless is definitely what you'll experience with these beautiful pieces! Though on the high-end of quality and price, Restoration Hardware won’t disappoint. With showrooms filled with beautiful oversized couches, epic dining pieces, and textures and patterns that will blow you away, Restoration Hardware is the place for you if you’re willing to spend a little more for a stunning home. Looking for feminine and bohemian colors and textures with modern lines and beautiful craftsmanship? Look no further! Anthropologie Home is the essence of beautiful bohemian home design. Though their unique pieces might be pricey, they'll be sure to give your home that one-of-a-kind feel of sophistication and luxury. Furnishing a home is EXPENSIVE! If your budget is a little tight, don't worry! There are endless options to get the style and feel that you love for a fraction of the price! Using websites such as Wayfair, Overstock, and Joss and Main will give you incredible deals on popular furniture and decor styles! Another amazing trick is to use apps like OfferUp, Facebook Marketplace, and Craigslist to find incredible, high end, used pieces for your home! Try searching keywords like "West Elm dining table," "Room&Board couch," and "Mid-Century Modern," and see what you can find! We’re just going to come right out and say it. YES! Home staging is so important! Sometimes when you’re selling a home that is either empty, or very lived in and well loved, it can be hard for the buyer to really picture themselves living in it! In fact, a whopping 81% of buyers have admitted that staging is helpful to visualize living in that particular home! And it doesn’t just affect buyers! “Buyers are willing to spend 1% to 5% more of the dollar value on a staged home than a non-staged home.” Essentially, investing in beautiful staging can really be a win win in the selling/buying process! 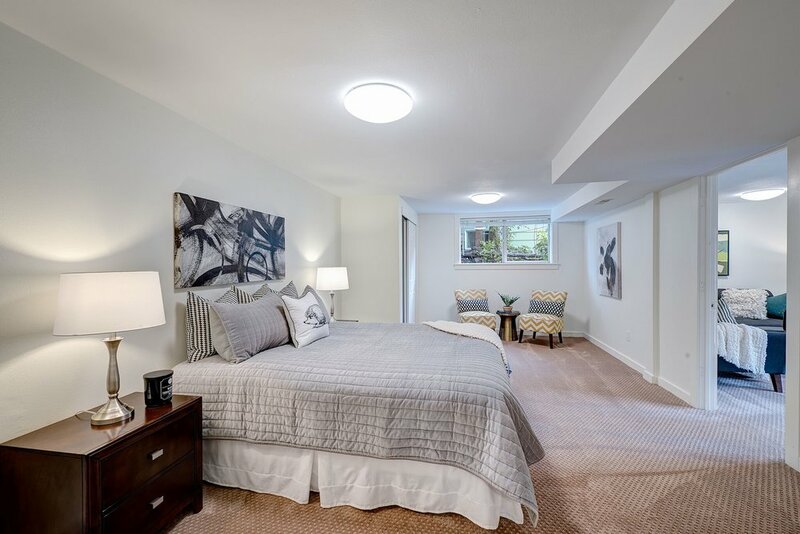 Another reason that we love staging so much is because Staging is an incredible tool that—when done well—can really push the potential buyers to put in an offer. Staging is a huge piece of selling a home because it can be used to really showcase the homes strengths, and minimize less desirable parts. Maybe the living room is smaller than average, but the kitchen is large and spacious. A stager could really jazz up that living room with some smaller and more appropriately sized furniture and decor, and strategically place a breakfast nook to suggest using that as an added place to hang out. Or maybe the home has some awkward nooks and oddly sized rooms. Sometimes spaces like that can feel awkward when it’s just an empty house, but if you stage it to be a little office nook, play room, or even a cool teen space, it helps the buyer visualize the creative ways that they could use that space! Staging helps buyers add value by fixing all of those little details that they normally wouldn’t! In fact, homes that are staged have the potential to bring in anywhere from 6 to 20 percent more than before staging! Staging isn’t just about going into a home and hanging some nice art and placing some furniture. They also can help you identify some cosmetic issues to fix before showing your home. If you have some dated carpet, or dingy wall paint, or your front yard needs some TLC, your stager will help you make those changes to make the most of your homes appearance! Taking the time and money to freshen up the paint, or put in new windows, it can make a huge difference on what your buyers will offer! Besides those essential updates, staging also will help you declutter your space if you haven’t already moved! When a buyer is envisioning living in a home, they’ll be more drawn to beautiful and simple spaces with zero clutter. Of course you love those ornate dishes you got from that relative you love, that quirky art piece you won, or your favorite tv show memorabilia, but the reality is that these things can make it difficult for buyers to imagine making the space their own! Decluttering and moving in simple, timeless pieces that neutralize a home can be so influential for a buyer to see their future life. The only downside to staging a home to sell? It can be pricey! Staging costs around $4,000 on average. But you're in luck! When you sell your home with Alise Roberts and Company, we offer completely complimentary staging! We want your selling process to feel smooth and easy, so staging is on us. We would love to answer any questions that you might have about how we can help you sell your home! Still don’t believe us that staging is a necessity? These before and afters of some of our recent properties speak for themselves!